Alfred Burt's "Jesu Parvule" with a text by Rev. Bates Burt as recorded by the "MPR Carolers"
If you've been shopping this holiday season, chances are you've heard a carol by Alfred Burt playing on the speaker overhead. Songs like "Caroling, Caroling" and "Some Children See Him" have become standards. His grand-niece Abbie Burt Betinis is upholding that tradition. The Minneapolis-based composer has written her fourth annual Christmas carol for the year 2004. Like two generations before her, Betinis will be sending her carol out as her holiday greeting card this year. St. Paul, Minn. — The tradition goes all the way back to Abbie's great-grandfather, Rev. Bates Burt. He wrote his first carol in 1922. Abbie says she found inspiration in the texts of his wartime sermons, the typescripts of which her family has kept all these years. Abbie shares two carols with us: a beautiful, but rarely performed carol by Alfred Burt, and premieres her composition for 2004. Both pieces are anchored by the writings of Rev. Bates Burt. In 1922, Rev. Bates G. Burt, a self-taught musician, began composing Christmas carols and sending them out as seasonal greeting cards to his friends, family, and parishioners. Twenty original carols later, he passed the job of composing the music to his son, Alfred Burt, a jazz trumpeter who had just received his music degree from the University of Michigan. 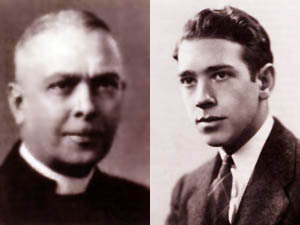 The father-son team produced five carols together, the first of which was "Jesu Parvule." Alfred Burt went on to write a total of 15 Christmas carols, including the popular "Caroling, Caroling," and "Some Children See Him," made famous originally by the Voices of Jimmy Joyce and now recorded by artists all over the world. At age 23, and in the midst of World War II, Alfred Burt was stationed in Texas with the Army Air Force Band. His father, ever devoted to Al's music, sent him an original poem and awaited Al's musical setting. In three short verses, Bates' text reflects the vulnerability of the world at war, the innocence of the baby Jesus, and the heavy charge of sacrifice that his birth foretells. "May no shadow gray, cloud one happy day of Thine infant play, blest Babe of Mary." Again in a volatile world, my great-grandfather's texts ring true. For my fourth annual Christmas carol, I looked to his Christmas sermons and political speeches dating from 1940-1946. In them, Bates speaks passionately about his hopes for a more loving world, his unwavering belief that a better peace exists, and wonders out loud whether we can each find that peace through the love inherent in the story of Christmas. Fortunately for me, many of his beautiful lines of prose are written so poetically that I was able to extract whole phrases and construct a new text for this year's carol around them. "Two...principles stand out vividly in the hopes which cluster around Christmas. The first is freedom. The dignity and beauty of the common life demand that men shall be free from want and fear – free to express honest thought and to develop their God-given personalities. Something was born at Bethlehem that denies the right of one man or one group – ever or anywhere – to exploit and oppress another." "We must have a better peace after this war than we had after the last, or once more the common man will have to wait to see his century dawn." "With eyes of faith which look backward through the years we, too, see the angels and hear their heavenly song. We kneel at the manger-cradle to behold and adore the child. Dare we ask what this vision means? ...In spite of all our fears, and all the dismal signs, and all the disheartening facts that confront us in a world at war – a world where force is the God of nations, and cruelty is a virtue – still the message rings down the ages telling us that these things need not be...."
Peace and Good-will to all, they sang, on Christmas morn. That from their want and fear all people shall be free. A better peace descends to us at Christmastime. So we wait in hope, and fear, to see our century dawn. And help us to keep sacred all the love He brings.